Different from normal MMOs, there is a upgrading system for weapons and accessories in Blade & Soul. 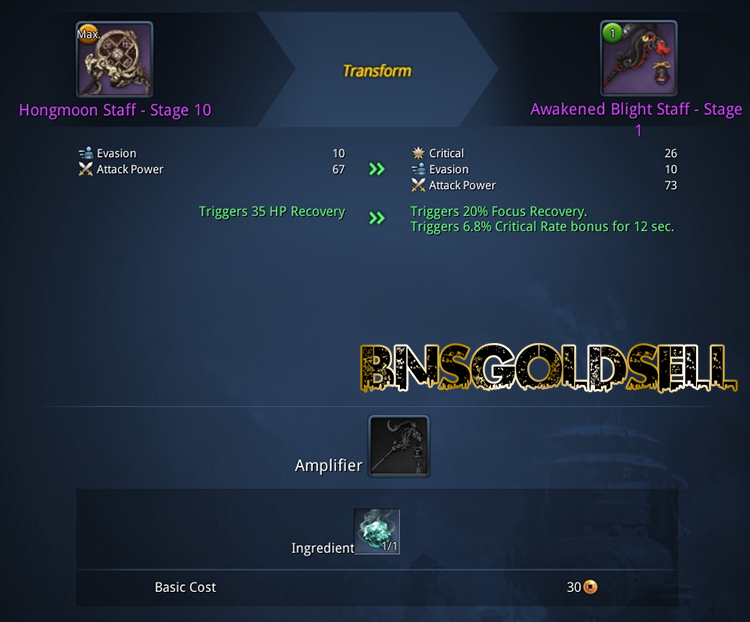 Weapons and accessories have two different systems to breakthrough as the weapons need a class specific breakthrough item and accessories need generic items which is easier to get. You can use any weapons or accessories to upgrade your Hongmoon set. The Hongmoon Sword, Staff, Razors you get at the very beginning is your endgame weapon. Generally speaking, you will have obtained the necklace, ring and earrings as well at level 20. These items evolve by combining weapons and accessories found out in the world into them. When they reach the maximum level, you can breakthrough and evolve it into another weapon, which will continue the progress. The process is fixed and you can’t choose how it evolves. But you can modify it with gems and the such later. 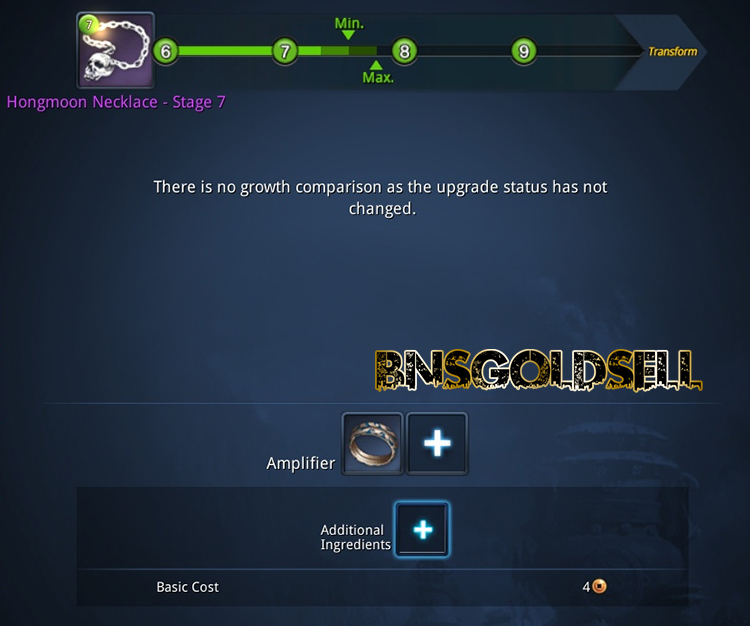 As for how to upgrade the weapon or accessories, click on it in your inventory and choose ‘manage equipment’, then you will see a slot for ‘Amplifer’. Drag a weapon for weapons, or accessory for an accessory into the box and you will a min and max at the top of the level bar. This is the minimum exp of the item. You can add some weapons at once. Besides, you can find gems that substitute for the amplifier. You can find the gear for upgrading as drops throughout the world and from the fortune wheels / world bosses that drop chests. You can find fortune charms from the hongmoon store and the daily dash, along with the replacement gems (which give huge XP bonuses). You can buy a lot of these items off of the marketplace too. Also, you can buy Blade and Soul gold to purchase these items for you. BNSGoldSell sells cheapest Blade and Soul gold with professional live service and safe delivery! Don’t unseal regular items as it is a waster of a valuable item to do do, only for breakthrough and transformation. By using a specific amplifier along with a specific ingredient, you can transform the item into a new item or breakthrough it into the next stage. Weapons need RNG luck and you need to unseal it. You can get these items through RNG box luck off of something like the fortune or a dungeon. The same as weapons, accessories needs items which are much easier to get as you can easily to get a Blade Dancer’s ring which works for anyone. As for how to get the extra ingredient, you can obtain from dungeons, daily dash, or quests. You can lower RNG on chests by using a key from the hongmoon store, if you want to skip a lot of the farming.